This is the action-packed story of a young woman who was called by God to fight for her country, France, during the Hundred Years' War. 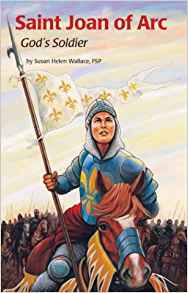 Leading the French to an improbable victory against the English, Joan listened to the voices of the saints calling her to action and fulfilled her special mission. After this triumph, she was imprisoned and burned at the stake, calling out "Jesus" for her final word. This story captures the courage and faith with which the Christian life is filled.